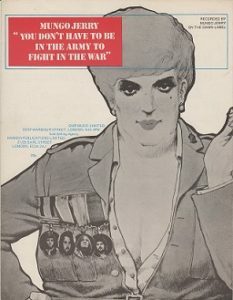 You Don’t Have To Be In The Army To Fight In The War, the title track from Mungo Jerry’s forthcoming album, the similarly titled You Don’t Have To Be In The Army, and the fourth maxi-single to chart at number thirteen in the UK singles chart. Tracks: You Don’t Have To Be In The Army To Fight In The War, The Sun Is Shining/O’Reilly, We Shall Be Free. 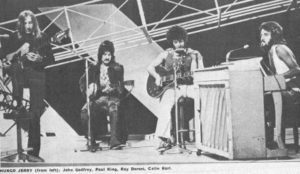 Ray Dorset said: “Most of the critics failed to understand the point that I was getting at with the lyric. “I think that they were thinking that I was referring to terrorist activities when in fact I was referring to general prejudice, and things that can happen to the everyday person such as losing your job for being late for work”. From out of the blue comes this new Mungo maxi-single. I say out of the blue because I had no advance knowledge of its release – it just turned up on my desk! The odd title is really a dig at present-day society and its attitude to the long-hairs, the drop-outs and the downtrodden. But it’s treated in very carefree roundelay style, with Ray Dorset joined by the other lads in the rousing chorus. All the usual Jerry trappings are in evidence, including kazoo, washboard, 12 string guitar, banjo and accordion. And between them, they churn out an extremely happy sound and an irresistible stomp beat. Maybe not quite so catchy as one or two of Mungo’s earlier discs but with four tracks totalling just 14 1/2 minutes, it’s bound to prove yet another massive seller for the boys. That’s Mungo Jerry. They are very heavily influenced by Memphis Jug Bands. I like it. I heard In The Summertime and thought it was a knockout. Did they do do ‘I Hear You Knocking’? No, they didn’t. I have always liked goodtime music. It’s the happy end of the blues”. George Ezra winner of the Brit Award for Best British Single 2015 for the song Budapest covered You Don’t Have To Be In The Army To Fight In The War as it is one of his all-time favourite songs.Ray Dorset met up with George backstage at one of his gigs and discussed their joint love of Dylan, Leadbelly & Woody Guthrie. The Waterboys during the recording of their Fishermans Blues album put down on tape their version of You Don’t Have To Be In The Army To Fight In The War and it is now available on the Fishermans Blues boxset. 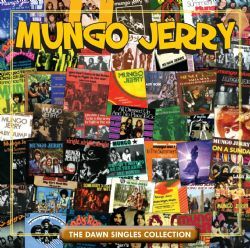 Mike Scott has been an avid follower of Mungo Jerry since his love of music began. 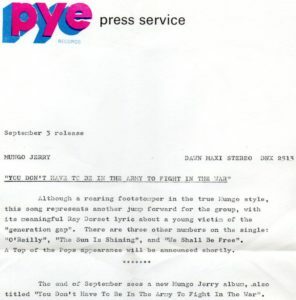 “Anto and I remembered this puckish Mungo Jerry single from our teens and recorded it for kicks, and to shred the preconceptions of our latest engineer victim. It was on the same day as The Prettiest Girl In Church so the guy must of been deliciously confused. Anto sang the high-pitched backing vocal”.